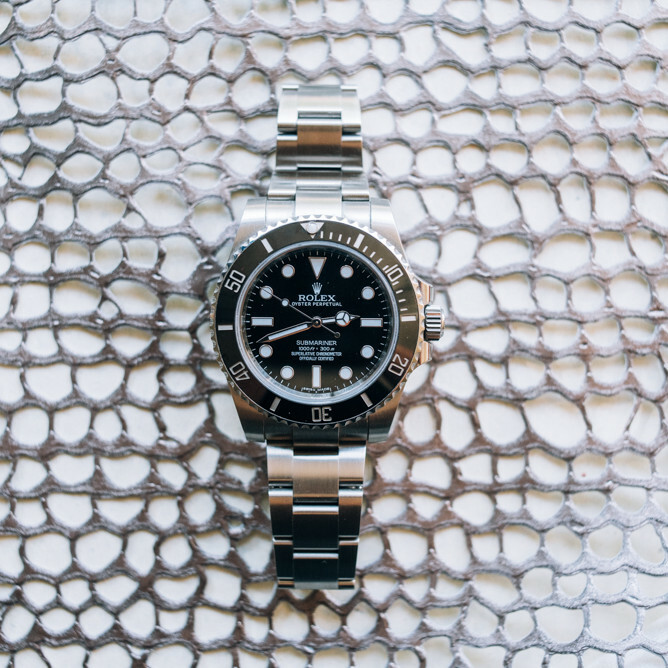 To call Rolex a symbol would be a textbook exercise in understatement. With more than a century of history and a raft of innovative features and designs under its belt, Rolex stands out as not only one of the most recognizable brands in the world but also one of the most trusted. Not only do they offer luxury watches that provide the best in design and aesthetics, but these are true timepieces as well, with artisan elements that create an accurate and dependable accessory. You don't have to break the bank to own one of these fabulous pieces, either — there's more than one watch that delivers on its brand's luxury reputation without a larger luxury price tag. Here are five to consider. The Datejust is one of Rolex's most iconic and storied model lines, with a history that stretches back to the end of the Second World War. This Oyster Perpetual Datejust, model #16014, represents a stylish and contemporary spin on the classic Datejust lines. Its fluted bezel, made from high-grade stainless steel, measures 35mm in diameter for a robust, easy to read men's watch. Bold stick markers surround the stunning blue dial. A fine example that comes in at a very reasonable $3,450. Another excellent contemporary entry in the Datejust line, this self-winding Oyster Perpetual is a piece that stands out with its brilliant colors and contrasting design. The typical stainless steel of the watch case frames the bezel, which features a fluted 14k gold design rather than a smooth look. Inside the 35mm watch case is a dial that features a delicate linen pattern that appears stitched in a champagne colored fabric. The hour markers tie the entire look together by standing out as simply lines of gold and black. At $2,590, this Datejust would be right at home in everyday use or paired with formal wear. For the ladies, the Datejust line offers as much elegance and sophistication as it does for the men — if not more! This model 69240 features a 25mm diameter for a slimmer, more feminine presentation but a bezel with the iconic Rolex engine-turned design, which serves to catch and reflect light for more visual appeal. Both the case and bezel feature pure stainless steel for an unbroken silver color that sets off the rose color of the dial. Rounding out this design are the hour markers — 11 square-cut diamonds around the watch dial, topped with the Rolex crown. The $3,250 price tag represents an enviable savings. This next Datejust for women is another example of many of Rolex's famous design elements coming together into one package that both looks gorgeous and performs flawlessly. Another watch with a fluted bezel, it works similarly to the engine-turned design to reflect flashes of light from afar — or is that twinkling coming from the diamonds that mark the hours on the champagne Jubilee dial? The dial also features the "Rolex" name patterning that creates a subtle and enticing geometric design. A thin streak of gold links down the steel bracelet adds a final complement, creating an unbroken band of gold that encircles the wrist and wraps around the watch dial. A larger, more imposing Datejust watch at 36mm, this men's model features the classic Oyster bracelet for secure fastening and unfastening without the risk of pinching your skin. Its simple band does not feature a large number of links, adding to the smooth, minimalist design of the case bezel and the unpretentious design of the dial. The price tag of $4,990 is an attractive savings for a watch that typically retails for more than $6,000. For the man who prefers simple, clean suits, this watch would provide the ideal pairing. Stephanie Smith has been a professional writer and graphic designer since 1992 and has enjoyed writing for the luxury watch industry for Wingate’s Quality Watches since 2003. Stephanie lives in the Dallas, Texas, area and enjoys traveling and spending quality time with her family.